Timber Wolf Atomic Steel Stone Washed Modified Skinner With Sheath | BUDK.com - Knives & Swords At The Lowest Prices! Timber Wolf is proud to release an all-new collection of Atomic Steel stonewash tactical blades that is sure to get your attention! 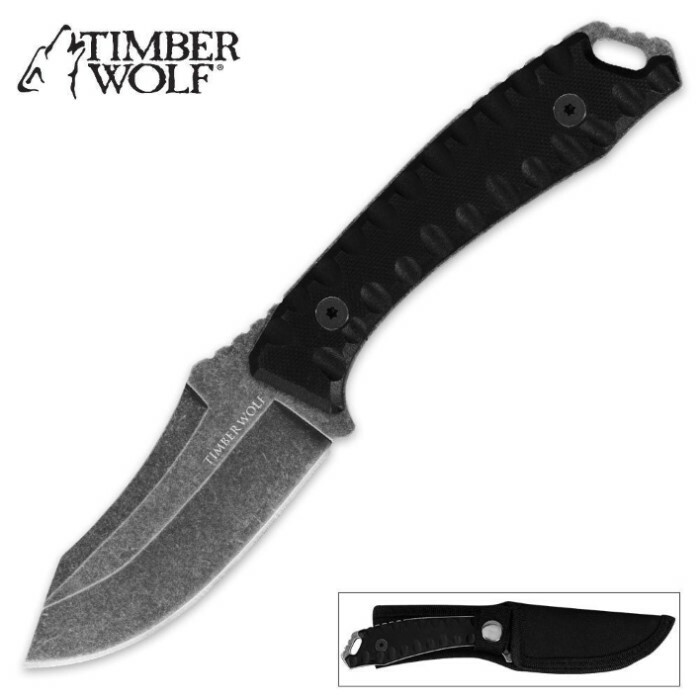 This powerful Timber Wolf Atomic Steel skinner features rock-solid, 3.5MM stainless steel construction with an attractive stonewash finish. The textured, G10 handle provides a sure grip for supreme control as you work this blade. Attach a lanyard to the end, and you'll have yourself one mean blade that's up for any challenge! "Nice knife, but B&S on sheath"
Recently got this knife on a great Bogo w/ free shipping. Of course you can't pass that up and I have always like the look of this line - you know the Schrade look-a-likes. Nice retention in hand, exposed pommel - could be a bit sharper, but easy to fix that. The SHEATH is NOT what is in the photo. It comes all the way up around the whole handle of the knife. There is absolutely NO easy or quick removal of this knife. Very awkward - Just FYI for everyone. I would call customer service to complain, but they don't really care - that has been my experience on things like this.